Moving rapidly to the left, the dynamic figure of a black man turns his head to scrutinize an unseen presence behind him. He carries a bow and arrows and holds one arrow, ready to string it and shoot. The archer is shown in half-length, a pose often used for figures at rest. Here, however, the artist has entirely recast the static nature of the format by dynamically turning the figure in space. The elimination of his lower body from view concentrates attention on the head and hands as the locus of resolute action. The sumptuous print measures almost a foot square and must always have been considered a true collector’s piece. It was engraved by the Dutch artist Jan de Visscher, following a drawing by his older brother Cornelis. It is undated, but the original design was most likely produced at some point during the decade before Cornelis’ death in 1658. It was published at least twice, both times in Amsterdam, suggesting a date late in the artist’s career, after he had settled in that city. The two Visscher brothers were most likely born in the northern Dutch city of Haarlem, where Cornelis may have been a pupil of Pieter Soutman, himself a student of the great Flemish artist Peter Paul Rubens. Born in 1628 or 1629, Cornelis had an extraordinarily productive career that lasted hardly more than 10 years. After his training, Cornelis matriculated in the Haarlem painters guild in 1653, though he soon moved to nearby Amsterdam. His brother Jan worked primarily as a printmaker, developing his skill to the level of consummate mastery required to coax the subtle descriptive effects and rich tonal range of his brother’s design from the surface of the copper printing plate. The textual complement to the image reinforces the feeling that the black archer inhabits a remote, primeval environment, in which success depends on martial skill and a perennial state of awareness. The sheer drama of a man captured in a state of heightened tension rivets the eye as the mind tries to fathom more fully the precise nature of his situation. For all of its calculated effect, the highly individualized subject is clearly derived from observable reality. To the left of the couplet, Cornelis declares in a standard Latin phrase that the figure was “drawn from life” (delineavit ad vivum). An early biographer took pains to note that the artist excelled at making rapid charcoal studies from the living model. A similarly detailed rendering of the black archer quite likely served as the intermediary between the figure drawn from life and the print as executed by the artist’s brother. When posing for the artist in his studio, the model was probably clothed as he appears here. Cornelis lived during a period of great social and cultural change ushered in by the independence of the Protestant-dominated northern Netherlands from Spanish Hapsburg rule during the late 16th century. The largely secular environment that emerged from this bold liberation from absolutist control led to a profound revision of Dutch society and culture, often characterized as the country’s golden age. One of the most significant developments of Dutch art during the early 17th century was the focus given to the individual figure in finished works of art. As was the case with other subjects, people of African descent were often represented. Closely observed studies of the living model had long been standard practice, as amply demonstrated by Rubens’ remarkable head studies of a black man. These small-scale works, however, were primarily intended for inclusion in more complex, finished works, and not for sale or display in their own right. The generation of Dutch artists before the de Visschers, on the other hand, had created a number of variations on the bust and half-length single-figure image. The most notable of these was the tronie, or character impression, in which the artist presented a living model, often posed as a well-known type from popular culture. The image of the black archer may bear some superficial resemblance to the tronie, but in fact it goes beyond this simple format to evoke a more complex, nuanced development of the subject. Cornelis has imagined a role for the black man as an African warrior or hunter, negotiating his wild native land on his own terms. Our engagement with the artistic process by which this image was created leads us back once again to the model himself, this time to wonder just who he was and how he came to be living not in Africa but in the jarringly different environment of 17th-century Holland. His availability to the artist took place within the context of Dutch involvement with the burgeoning African slave trade. Its practice in Holland was carried out by the Dutch West India Company, chartered to a consortium of merchants in 1621, the same decade that saw Cornelis’ birth. By the 1640s the Dutch had wrested control of all Portuguese slave-trading posts on the Gold Coast of West Africa, including the important base of Elmina. With the establishment of colonies and slave markets in the New World, the Dutch became one of the chief suppliers of slave labor to European overseas possessions. 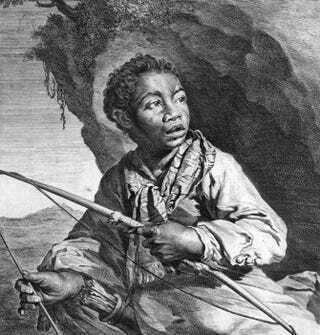 Although slavery seems never to have been officially recognized in the Netherlands, the young African man so memorably portrayed as a far-ranging archer in the print had almost certainly come from Africa against his will and, once abroad, had no real hope of ever returning to his native land. His actual situation adds a poignant note of irony to the fictional attitude of freedom and agency bestowed on him by the artist. From the evidence of the Black Archer discussed here, as well as other works by Rembrandt and his associates, black people were a fairly common sight in the early modern Netherlands. Some may have worked as domestic servants, perhaps in the very households of the artists who painted them. Others were effectively slaves, at least in origin. In the case of the young archer here, the innately noble character of a son of Africa was given a chance to survive, if only held within the ripe fantasy of the European imagination.